Happy Christmas and New Year from JVDPPP! We end the year with Christmas and New Year greetings to all and this beautiful Adoration of the Shepherds by Jordaens. It was rediscovered by the Project in the Palazzo Chiericati, Musei Civici Vicenza, in March 2017. The painting is first recorded in the museum’s inventories in 1902, as a painting in the style of Erasmus Quellinus II (1607-1678). 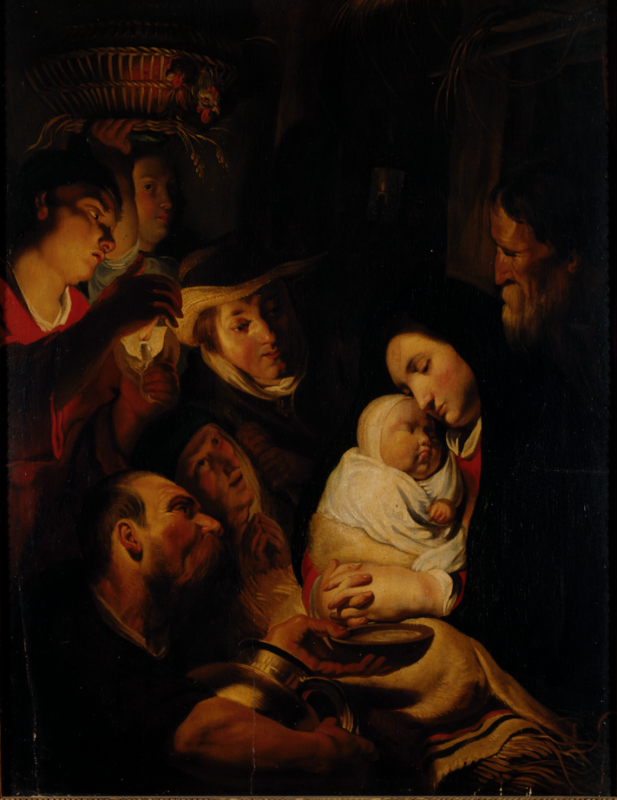 Based on black and white photographs sent through the post, Flemish art historians later considered that it was a copy related to the Adoration of the Shepherds by Jordaens in the Museum Mayer Van Den Bergh in Antwerp. It was recorded as such in the Musei Civici’s catalogue, until now. 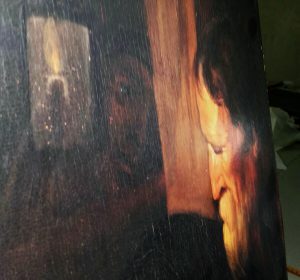 The painting was examined in Vicenza by the Jordaens and Van Dyck Panel Paintings Project on 1 March 2017. It exhibits significant pentimenti (changes made to the composition by the artist while painting), visible to the naked eye. 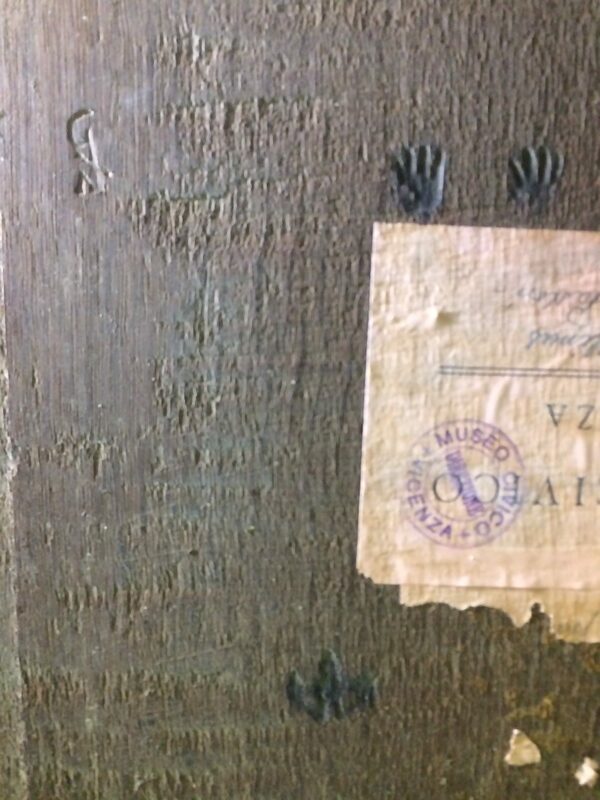 A piece of backing wood was removed to reveal the reverse of the original oak panel. 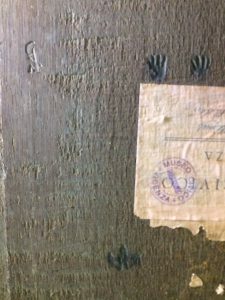 The panel maker’s mark attributed to Guilliam Aertsen, a Master in the Guild of Saint Luke from 1612, and the Guild’s quality control mark, the castle and two hands of Antwerp (made with two separate branding irons), are clearly visible. The use of the Antwerp brand to approve panels for painting is enshrined in an ordinance dated 1617. The Adoration was painted on two conjoined oak planks. Dendrochronological analysis reveals that they were cut from a tree which was probably felled between 1612 and 1625. The wood is a very close match to the wood of the Christ by Sir Anthony Van Dyck (1599-1641) in the Palazzo Rosso, Genoa and his apostle Andrew in the Museo de Arte di Ponce, Puerto Rico. The trees started growing in the Middle Ages, close together in the same Baltic forest, possibly Poland, before being cut down and shipped to Antwerp. These elements, combined with first-hand stylistic comparison of other Adorations by Jordaens, including the version in the Museum Mayer Van Den Bergh, lead the Project to conclude that the Vicenza painting is not a copy but an original dating from around 1618. Before Jordaens established his own studio in 1620-1 and Van Dyck left for England in October 1620, both young artists worked alongside each other with Sir Peter Paul Rubens (1577-1640). With many thanks to Prof. Dr. Giovanni Villa, Dr. Chiara Signorini and Ms. Frances Hargreaves at the Musei Civici di Vicenza for their great help and kind assistance. How to cite: Davies, Justin. “Happy Christmas and New Year from JVDPPP!” In Jordaens Van Dyck Panel Paintings Project.